Surviving winter in New England is no easy task. Fortunately, Boston Organics keeps your kitchen stocked with fresh, healthy food even if you don’t feel like going outside. 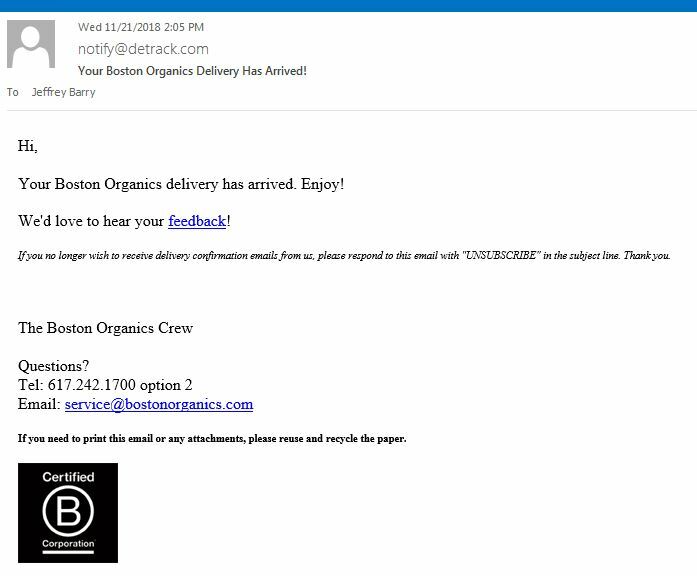 Some of you have been using Boston Organics for several years, but many of you are new to our service. 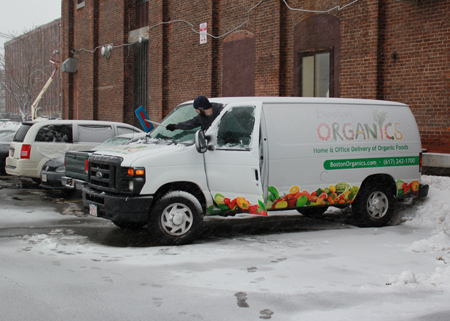 Here are five tips that will help you make the most of your Boston Organics experience this winter. We want to make it as convenient as possible for you to eat healthy, which is why we bring farm-fresh organic produce directly to you! For your safety and for the safety of our delivery drivers, please make sure that your delivery location is easily accessible from the street and that the pathway is shoveled and de-iced. If your delivery location is not covered, please close your empty bins and store them upside down to keep them from filling up with snow and ice. It’s easy to change your delivery location for the wintertime. Just head to the delivery address section of our website and click "view/edit/change" and then "update address instructions." Once your delivery has been made, an automated email will be sent to the email address you signed up with. We schedule all residential deliveries between 10am and 5pm and our fleet manager custom designs each day's delivery routes to maximize efficiency and limit our fossil-fuel consumption. While we're not able to guarantee a specific delivery window, we're happy to contact your driver to check on the status of your delivery. In most cases, we can then give you an estimated arrival time. Send us an email or give us a call the morning of your delivery to find out whether your delivery will be made early in the morning or later in the afternoon. 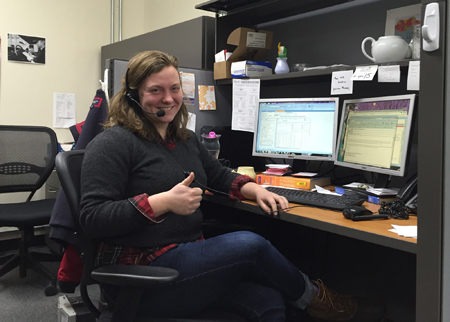 Our friendly customer service team is here to help! This insider tip is an obvious solution for keeping your food fresh in the summer heat, but leaving an insulated cooler at your drop off location can go a long way in keeping your delicate veggies (read: lettuce) from freezing. As an added bonus, our drivers will take the empty bin back with them so you don’t have to worry about remembering to leave your empty bins out each week! 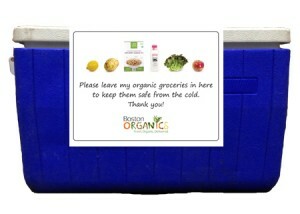 If you want to start leaving out a cooler, we kindly ask that you let us know in an email and clearly label the cooler for Boston Organics Deliveries. Click here to print out a label. 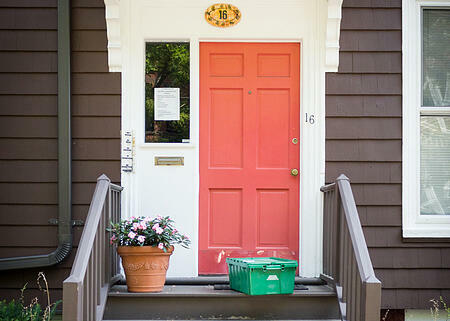 Want to know the key to keeping your groceries safe and fresh while they wait for you to come home? 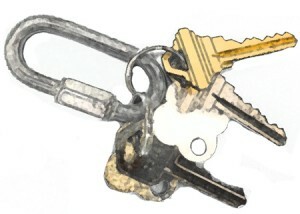 It only takes 2 steps to make this happen: Update your delivery instructions and send in your key. Our dedicated and experienced drivers make deliveries in the summer heat and the dead of winter. We’ll bring your groceries through wind, rain, snow and ice. But sometimes the weather conditions make it unsafe to be on the road. On these rare occasions, we’ll send updated delivery information to you by email and in posts via our social media pages. Keep your eyes on your inbox and on our Facebook, Twitter and Instagram pages. 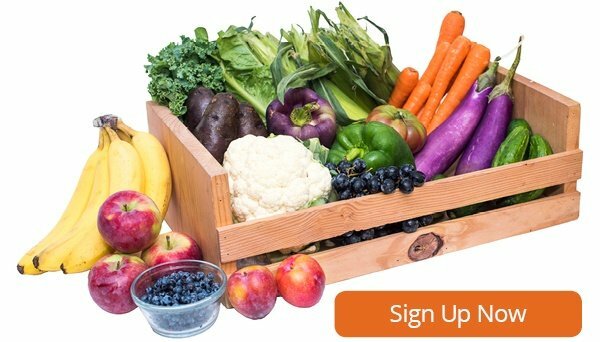 Our weekly newsletter and regular social media posts keep you up to date on the latest news from Boston Organics and gives you great recipe ideas all winter long!